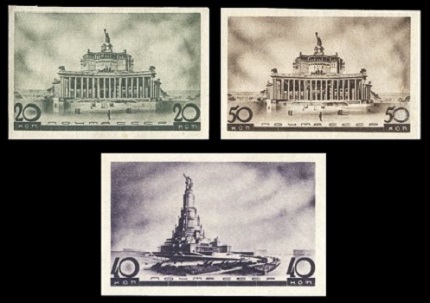 The commemorative USSR stamps of 1937 honored two famous Russians and contemporary Soviet architecture. 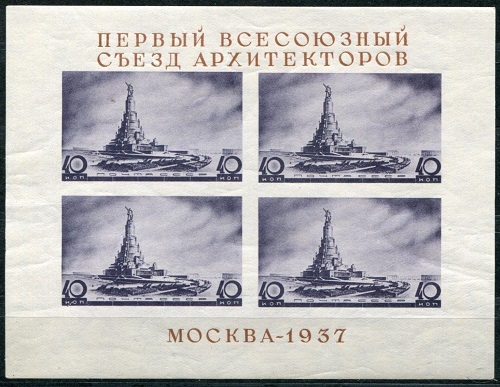 The number of commemorative stamps issued in 1937 was still pretty small, by the standards of the Soviet Union in later years. There were only twenty stamps issued, for three commemorative events! The USSR would more than make up for the small number of issues during 1936 and 1937, as they would issue 95 commemorative and 15 definitive stamps (per the 2008 Scott Classic Specialized Catalogue), not including varieties, during 1938! 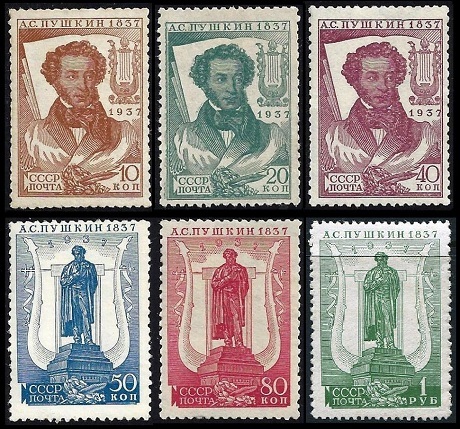 The six pictorial USSR stamps shown above were issued in February 1937 to commemorate the 100th Anniversary of the Death of Alexander Pushkin. The stamps are printed on both chalky and white paper, and they are perforated 11 to 14 and compound. For the specialist wishing to see the five different category listings of these stamps, please refer to the Zagorsky Catalogue. The two common designs feature a portrait of Alexander Pushkin (1799-1837), the famous Russian writer and poet, and the statue of Alexander Pushkin in Moscow. 10 K. (1937 - Sc. #590) - Yellow Brown. 20 K. (1937 - Sc. #591) - Prussian Green. 40 K. (1937 - Sc. #592) - Rose Lake. 50 K. (1937 - Sc. #593) - Blue. 80 K. (1937 - Sc. #594) - Carmine Rose. 01 R. (1937 - Sc. #595) - Green. The Alexander Pushkin commemorative souvenir sheet shown above (Sc. 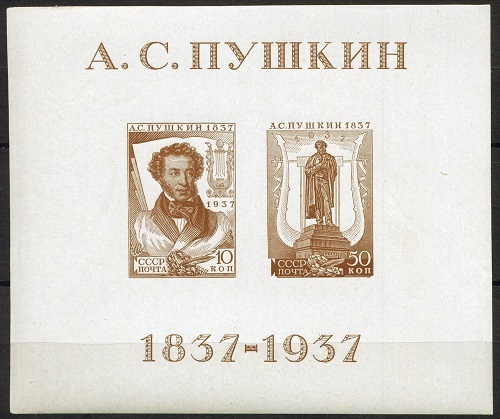 #596) was issued in February 1937 for the All-Union Philatelic Exhibition in Moscow. It utilizes both of the stamp designs, and they are printed in brown. 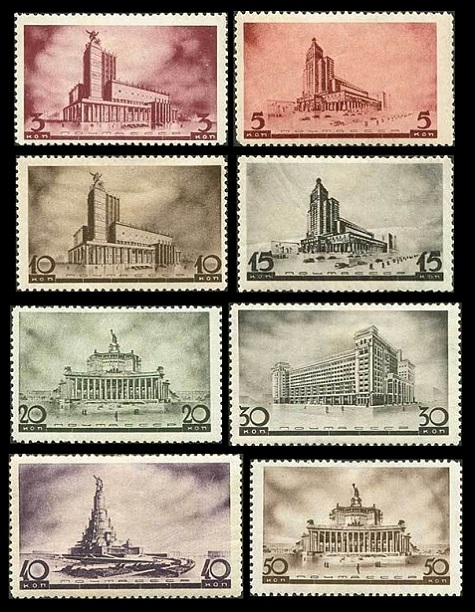 The eight pictorial USSR stamps shown above were issued in June 1937 to publicize Architectural Designs for a New Moscow. The stamps are perforated 12. All of these stamps, except for the 30 K. denomination, exist imperforate, but they were not regularly issued in that format. A variety of the 30 K. denomination exists perforated 11. 03 K. (Sc. #597) - Tchaikovsky Concert Hall. 05 K. (Sc. #598) - Telegraph Agency House. 10 K. (Sc. #599) - Tchaikovsky Concert Hall. 15 K. (Sc. #600) - Telegraph Agency House. 20 K. (Sc. #601) - Red Army Theater. 30 K. (Sc. #602) - Hotel Moscow. 40 K. (Sc. #603) - Palace of the Soviets. 50 K. (Sc. #604) - Red Army Theater. The Architecture souvenir sheet shown above (Sc. #603a) was issued in June 1937 for the First All-Union Congress of Architects. A very rare variety of this souvenir sheet exists without the lines of text. 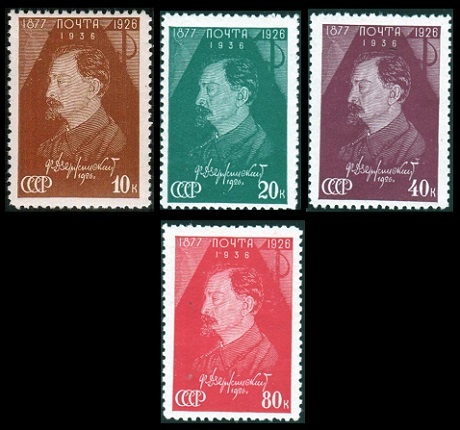 The four pictorial USSR stamps shown above were issued on July 27, 1937 to commemorate the 10th Anniversary of the Death of Feliks Dzerzhinski. The stamps feature the portrait and signature of Feliks Dzerzhinski (1877-1926), the founder of the Soviet Secret Police (K.G.B.). These stamps also exist imperforate, but they were not issued in that format. 10 K. (1937 - Sc. #606) - Yellow Brown. 20 K. (1937 - Sc. #607) - Prussian Green. 40 K. (1937 - Sc. #608) - Rose Lake. 80 K. (1937 - Sc. #609) - Carmine.